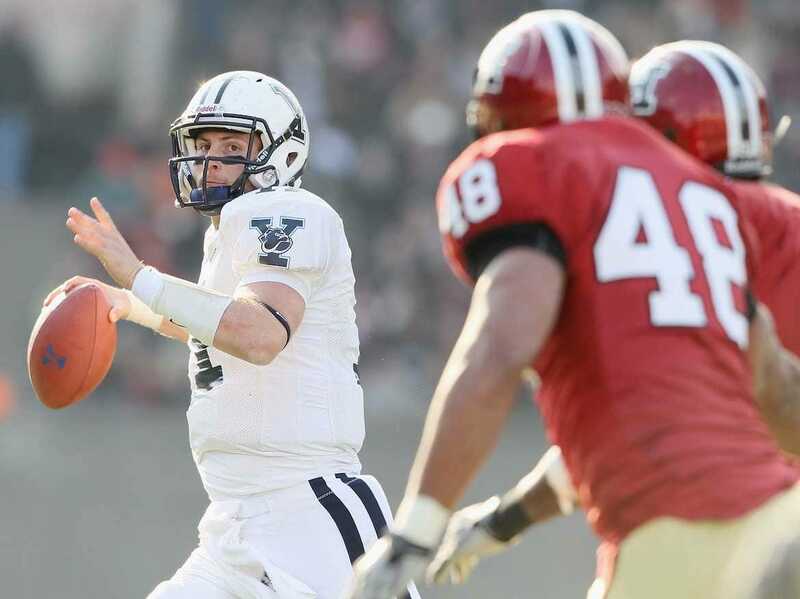 Elsa/Getty ImagesYale quarterback Patrick Witt of the Yale Bulldogs looks to pass against the Harvard Crimson in a 2010 game. Former star Yale University quarterback Patrick Witt has come out against Harvard University’s new sexual assault policy in a Boston Globe op-ed, writing that his life was “nearly ruined” by a similar policy at Yale. Witt gained national attention his senior year when he was faced with the choice of keeping an interview with the Rhodes Scholarship Trust or play in “The Game,” the last football game of the season against rival Harvard University — both were scheduled on the same day. When Witt chose to play in The Game, the was some controversy as to whether his Rhodes Scholarship interview was revoked following an informal sexual assault complaint against him. The destructive power that Yale’s and now Harvard’s new sexual misconduct policies wield is immense and grossly underestimated. By giving to unsubstantiated accusations the confoundingly difficult-to-define title of “informal complaint” — and denying accused students an opportunity to clear their names — these policies place the entire weight of the university’s reputation on the side of the accuser and against the accused. After all, if you didn’t do anything wrong, then why has your school recognised a complaint against you, informal or otherwise? The former Yale undergraduate is now a first-year student at Harvard Law School, where 28 professors recently wrote a Globe op-ed blasting the same sexual assault policy to which Witt objects, which implements a “preponderance of evidence” standard for sexual assault investigations and creates a centralized university office of trained investigators to handle any complaints. Notably, Witt vehemently denied that the informal sexual assault complaint had any effect on his decision to choose The Game over his Rhodes interview. A New York Times article explicity made the link between the complaint and Witt’s alleged loss of an interview with the Rhodes Trust.